Microsoft and 343 Industries are being stereotypically tight lipped about Halo 5, but a hoaxing company is attempting to steal the spotlight. Swenzy is a viral marketing company that specializes in extremely shifty business practices. The company is probably best known for creating a website that "counted down" to the PC release date for Grand Theft Auto 5. But it also "leaked" several images that were supposedly linked to a GTA sequel called City of Paradise. Obviously both were fake. Well, they're at it again, and this article is an attempt to kneecap their new operation before it even gets rolling. Recently, Swenzy purchased Dawnof2014.com, and outfitted the site with a series of vague Halo 5 references. 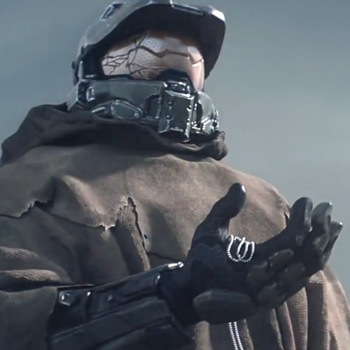 The background image mirrors the desert setting that Microsoft showed off during its E3 presentation, and the site's tagline is "He Returns... Exclusively On Xbox One!" Jessica Shea, 343 Industries' community manager, was quick to dismiss the website when asked for a comment on Twitter. "We don't comment on things unrelated to Halo," She said. "Sorry." Swenzy typically tries to funnel traffic from their hoax websites into their social media company's pages. Once there, you're guaranteed to feel like your computer is being infected with hundreds of viruses, which is why I'm choosing not to program a hyperlink. You're welcome.